You can raise money for the school simply by shopping online. We’ve already raised over £1,000 thanks to parents using easyfundraising. Around 3,000 retailers are on board with the scheme, including Amazon, John Lewis, Aviva, thetrainline, Toys R Us, Marks & Spencer, Debenhams and Sainsbury’s. And it’s free with no annoying ads! More people than ever use their phones and tablets to shop online so the mobile app makes it even easier for you to raise donations when you shop on the go. The easyfundraising App is available for both iPhone and Android and is free to download. Everyone shops on Amazon – yet they don’t pay the taxes they should – so why not make them give money to FAB?! It’s easy… just make AmazonSmile your default for all Amazon purchases!! Does your employer run a charity fund-matching scheme? Please ask, as lots of companies match funds raised by employees at charity events. Two Balfour parents have raised £1,000 each for the school from their employers, simply by helping out at the Christmas and Summer Fairs. 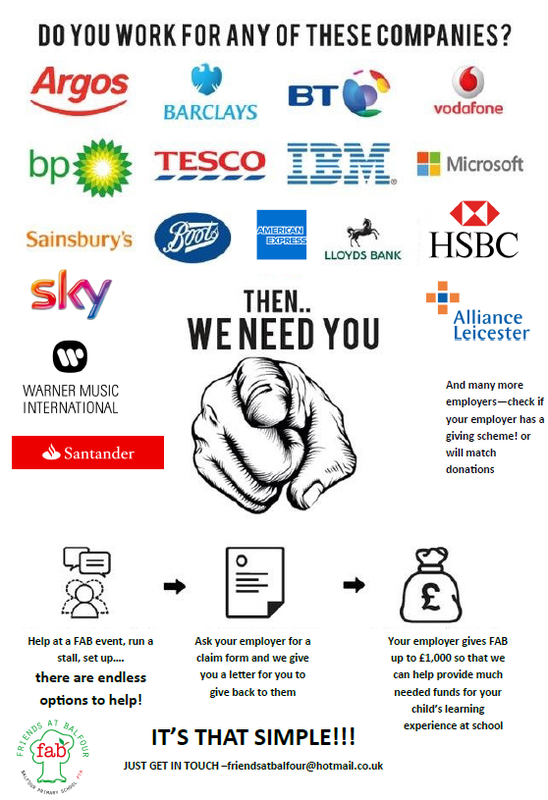 The following companies in the UK are those that we understand currently match gifts donated by their employees – however, this list is not definitive! If your employer is not listed, please contact your Human Resources department to find out if they operate a matching gift scheme. A number of companies abroad, especially in the US, also operate similar schemes. Please contact your Human Resources department to make a matching gift, they should be able to give you a form to fill in confirming the gift you have made. You then send that form to us so we can confirm receipt of the gift. That’s all there is to it!!! For more information please contact us.